GROWING up can leave a person with all sorts of feelings. The feeling of being small, insignificant, being stuck in an inter-phase between 'neither a grown-up nor a kid anymore' and not knowing your own place in the great chain reaction of life - yes, it's all part of growing up. Ah, so many things we are so brutally denied just because of that accursed label of a 'kid'! “When I grow up, things will be different and I will be happy,” we promise ourselves over and over again. But little do we know that the path to 'growing up' is actually not that graciously easy as we had perceived before. 'Independence', in itself, is a very beautiful word and there is hardly anybody who doesn't crave for it. Doing whatever you want to do whenever you want to do, obviously feels heavenly. It starts with small part-time jobs to get a little extra dough alongside that monthly allowance, then maybe a little tutoring flourish, youth club activities, workshops, internships and what not - real life beyond the protected, everyday household life, slowly but steadily, reaches its hands towards us. “A little exposure like that is nothing! You will not last even a second in the practical world outside. We have seen better and we do know better,” our protectors' words only incense us further. “Here's to growing up,” shoulders squared, we take the plunge towards a lifetime of change. While this change may come to different people in different ways, a good portion of it happens when young people choose to go to colleges/universities in different towns or countries away from home and enter the latest phase of their lives: dorm-life. The first step to being independent, no doubt, at first thrills people out of their minds. No nagging parents hovering over you twenty four-seven, no whining about 'eating the right thing' or 'sleeping at the right time' (what's a right time?! People tend to forget 'trivial' matters like these eventually), staying out as long as you want, studying if you feel like, partying if you don't - life just can't get any better. The best part about living in a dorm is that the idea of traffic jams eventually becomes non-existent inside your head because you get to live inside the campus. It's a good thing, seriously. Less time spent stuck in jams, more time for studying and, um, other stuff. Sounds fun? It's just half of the story. Dorm life is not your average picnic. Let's get a little practical for a change - people live in dorms mostly because they don't have a place to live in the city. 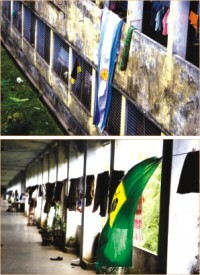 In Dhaka University, for example, countless students come from outside Dhaka and become residential members of different halls, their numbers too great for adequate accommodation facilities. Hence the recent reports of male students resorting to flooring in the dorm verandahs and such. 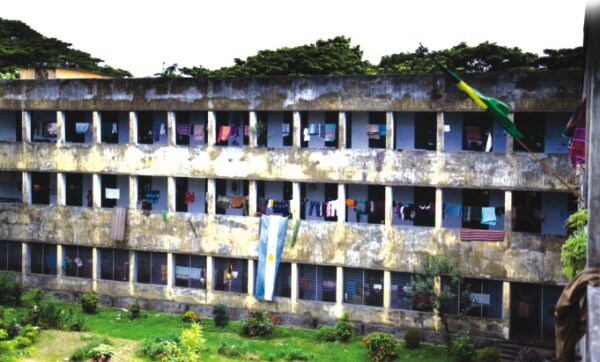 Female dorms, however, are in better shape. They have a system of housing six students per room. The rooms are spacious and furnished with beds and desks provided by the hall authority. Two senior students are allowed to take a bed each while the juniors must share. So here's your trickiest part of dorm life in all its glory: senior-junior cohabitation that often triggers terms like 'ragging', 'in-fights', 'mood-swing rifts' and mostly in case of the male dorms, 'compulsory participation in student politics'. When a person first enrols into a dorm, the first thing he/she must do is to try and fit in with his/her roommates, even floormates if necessary. It's a whole world of adjustments he/she must make: new room, new room-chores, new food system, new sleeping arrangements, new toilet habits - the list can go on and on. There's a definite yearly housing fee and the meals must be bought daily, so if you're paying for these things yourself (they don't cost much) you can as well consider yourself living on your own. Studying, on the other hand, is a fun affair when you're living in dorms, if you have yearmates that is. There are weekly study-nights when people sit down with all their notes and books and study, then gossip and eat, then again they study, and gossip and eat and the cycle goes on. Good thing is, some amount of studying is done and seeing your friends struggling with the same amount of study-load as you (given your friends are not super-nerds) may relieve your own stress a little. It's a good way to get away from exam/study-phobia, if you have any. About roommates, it's best to get not too involved yet not too less involved with them. It's an art, maybe more of a life-skill, you MUST learn it. There are many kinds of people out there, you may like some or you may not, you've just got to learn how to live with them. This is a very useful lesson of dorm-life: even if you don't like, you must learn to respect. And after all these struggles and inner-battles to get stronger, there may be some times when you will find yourself staring at the ceiling and thinking about stuff, unable to sleep, still not fully used to the new environment, missing your old room, your house, maybe missing your parents a little, how they used to nag about every little thing… and suddenly you miss that stupid nagging so much you start feeling upset. Yeah, things like that happen all the time. Because growing up doesn't necessarily mean growing inhuman or anything. And after all, the main reason we want to grow up, to become responsible and stronger, is because we want to make our folks have some pride in us. There's nothing more we'd love than for them to clap us on the back and say, “Welcome to the league. We are proud of you.” or something along that line, right? Yeah, guess people can be just silly like that.